I booked a WT return in the recent avios promo and and trying to figure out where to sit. thebasource.com is your friend on all seatmap related queries - that's a B777-200 17F/48J/24W/127J, as shown here. No specific relevant experience of that layout & cabin combination, but your choice looks like a decent one to me especially if legroom is important, although you may be disturbed by folks queuing for the toilet. Super High J 747 heading to BOS, travelling alone. Undecided between taking one of the pairs and hope theoretical seating keeps the next one free, or 40D for extra leg room and being among the first to leave the Y cabin for customs. What's the likelyhood I'd get bumped off the bulkhead seat due to a group with a baby sat next to me? Anything could happen really re a family being seated there between now and your flight so unpredictable really. Personally and assuming your average height? I'd plump for row 52 and the window going westbound. You can stretch out a bit sideways and put your feet up on a small rucksack if you have one with you. Done this quite a few times over the years and if Gold TS may stick, possibly. corporate-wage-slave and BertieBadger like this. Happy to be told otherwise, but I didn't think they would bump you for a family. You can't get the bassinet seat itself but to my knowledge you won't get moved out a seat adjacent to the bassinet just because an infant is travelling with a family group. Indeed there was a thread fairly recently where due to an aircraft swap, a group with an infant found only the bassinet itself seat free, but not the adjacent seats. That passenger thought they should move the other passengers so their group could remain together but BA declined to do so. Now, with that all said, I think I'd agree with PETER01 and unless I was in a huge hurry to get across the border, go for the pairs at the rear. Until about T-36ish before departure and of course you will be quite correctly booted out if it is needed for an infant. Thank you both for your replies. Indeed, I'm only 5ft8, so I don't anticipate being that uncomfortable at one of the standard seats, especially if I get lucky with TS. My main concern is really ending up at the back of the queue for customs. In fact, I'm a bit wary of having an infant next to me all flight, even with noise cancelling headphones! This is BA213, arriving at BOS 1455. Does anyone reading this have any idea how busy they're likely to be at this time? If not much, I'm fine at the back. That's generally a good time to arrive into BOS, assuming no delays departing, it's the evenings on Thursdays and Fridays, particularly during UK and Irish school holidays which are the most problematic. There are only a few other aircraft arriving that early. If this is a big nuisance for you then consider Global Entry. Alas I am not currently eligible for Global Entry, as I'm not technically a British citizen, despite living here for a good while and feeling like it. I'm working on it. That said, while it's a Thursday in arriving, it's not a school holiday, so given that, I think I'll take the back. One more question, do the rearmost pairs recline fully? If so, I'll take one of those for the guilt free recline, but if not I'll go one row ahead. Yes. 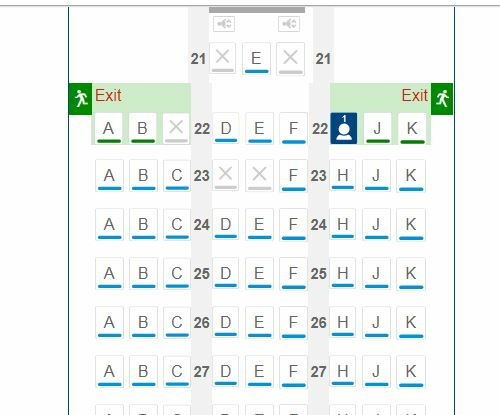 All seats that should recline now do so fully on all of BA's fleet, despite what seatguru (and linked sites) would have you believe. Thank you. 53H it is then. Fingers crossed for TS to work on my favour. Although do you mean the long haul fleet? I'm pretty sure the pair of seats at the back of A319s don't recline. They would be in my category of seats that aren't designed to recline, along with exit row seats and SL3510 seats. I see what you mean, fair enough. Thanks again!